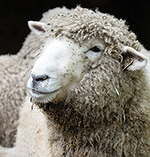 Veterinarian Rachael Gately was headed to Tina Shippee’s house to vaccinate some of her Romney sheep—a teddy-bearish breed that Shippee’s twin daughters show at fairs across southern New England. Billington called the Tufts Ambulatory Service for help. Gately is one of the service’s nine large-animal veterinarians who make house calls to farms all over southern New England, caring for sheep, goats, cattle, pigs and horses. They make about 4,000 farm visits each year. The traveling vets are headquartered in Woodstock, Conn., in a building with classroom space, a laboratory and a large-animal treatment area. Most days, though, they’re on the road. Service staffers manage the phones, helping the veterinarians juggle regular wellness visits with all manner of emergencies. Billington had given Josephine a drug called Banamine (basically, equine ibuprofen), so by the time Gately arrives at Billington’s home in Foster, R.I., the horse is on her feet. She climbs out of a truck stocked with bottles of medication, buckets, overalls, galoshes and something resembling an accountant’s fat briefcase—a portable ultrasound machine. Today, she is accompanied by Cummings School students Emily Picciotto and Elissa Mopper, both V15. 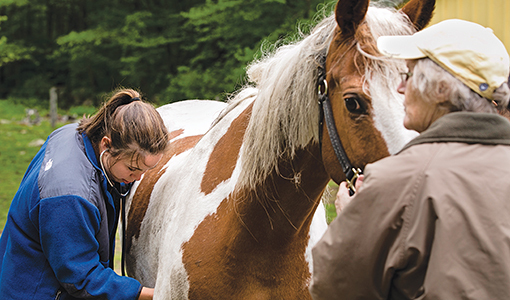 All veterinary students have two chances to rotate through the ambulatory service; second-year students spend a day there as part of their clinical rotations, and fourth-years complete a three-week rotation to fulfill their core clinical requirements. 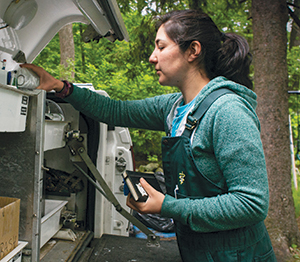 Emily Picciotto, V15, gets supplies from the Tufts Ambulatory Service truck. Picciotto and Mopper watch as Gately listens to the mare’s heart, inspects her mouth and gums and takes her temperature. She then dons a long glove and gives the horse a rectal exam. She is in shoulder deep when she feels something amiss. “The spleen feels like a shark fin,” she announces. “What could that mean?” she quizzes the students. They arrive precisely at the answer Gately had in mind: an enlarged and displaced spleen, a serious condition called nephrosplenic entrapment. It’s not clear that is what is ailing Josephine, Gately says. Some horses just have more prominent spleens. Because the mare seems more comfortable, Gately prescribes extra water and a very light supper. But should the horse’s condition worsen, the next step would be to administer a drug that helps shrink the spleen. Still, Gately thinks Josephine is likely out of the woods.